The famous chef, Jamie Oliver, and other British celebrities donated their time and talents to make the Second British Lithuanian Charity Gala Dinner in London a resounding success. Held at the exclusive Hurlingham golf club in London on April 17, 2008, the function overall raised well over $A 200,000, with the Lithuanian government matching the money raised at the function. The proceeds of the black-tie gala dinner will be devoted to helping poor children from large families in the Tauragė district of Lithuania. 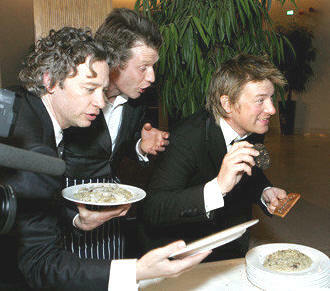 auctioning off Jamie Oliver’s tasty risotto. The list of British celebrities at the dinner included the actors Dexter Fletcher and Jason Flemyng, the famous portrait artist Jonathan Yeo, the noted photographer David Loftus, all whom donated prizes to be auctioned at the dinner, with Dexter Fletcher and Jason Flemyng as the auctioneers. For the auction Jamie Oliver, together with the famous chef Ginaro Contaldo, also created a tasty risotto, with truffles and parmesan, which was auctioned off to be served to the winning table. Musical entertainment during the evening was provided by young Lithuanian operatic stars, already making their mark on the world’s opera stages. They performed excerpts from Mozart’s "Magic Flute" dressed in costumes designed by the noted Lithuanian couturier Juozas Statkevičius, from the production of "Magic Flute" by Dalia Ibelhauptaitė.